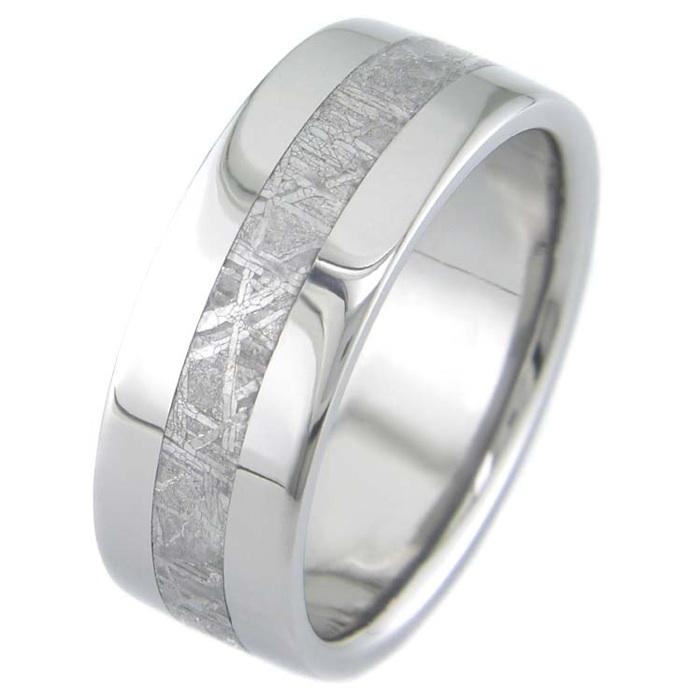 Style #101 Custom Made Titanium Lined Meteorite Rings Price: ONLY $595.00! Style #102 Custom Made Eccentric Titanium Lined Meteorite Ring with Tension Setting. 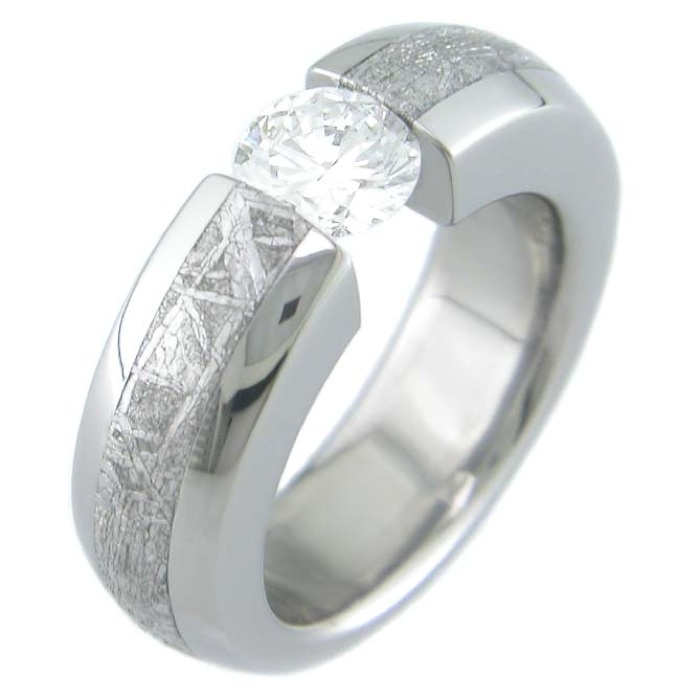 Price: ONLY $1295.00 w/ CZ stone! Please enquire for price with diamond. Please note that there are NO RETURNS on this style of ring. 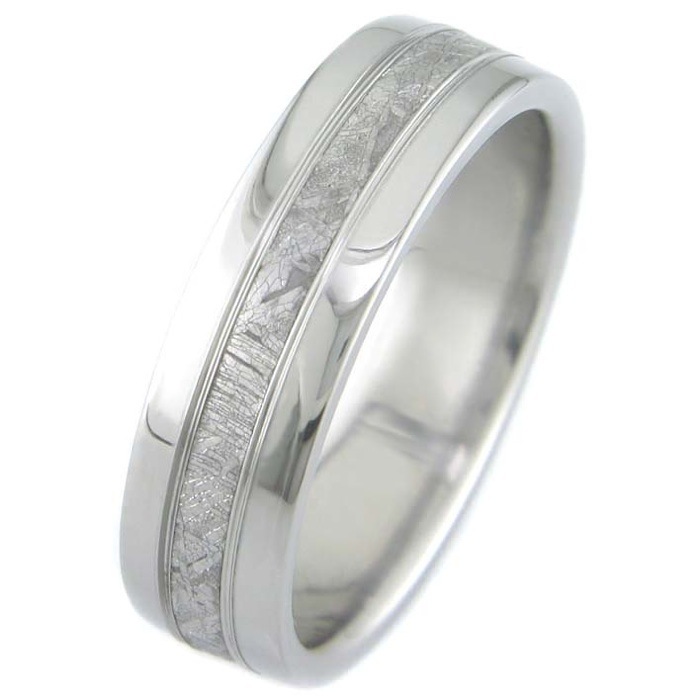 Style #103 Custom Made Titanium Lined Meteorite Rings Price: ONLY $595.00! 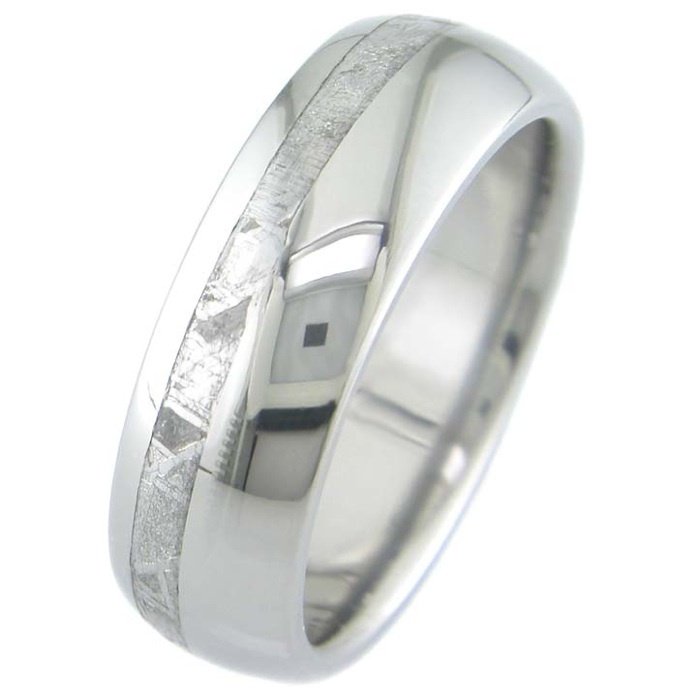 Style #104 Custom Made Titanium Lined Meteorite Rings Price: ONLY $595.00! 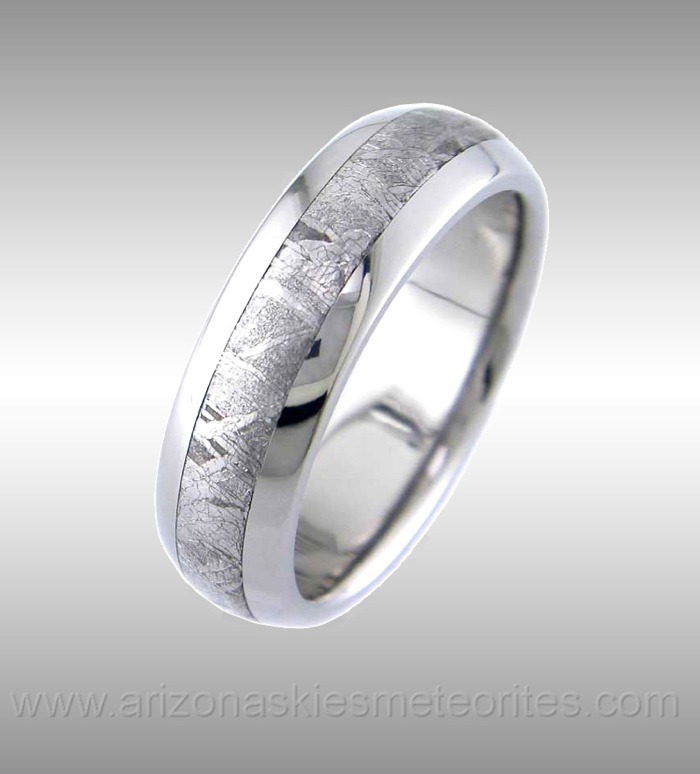 Style #105 Custom Made Titanium Lined Meteorite Rings Price: ONLY $595.00! Welcome to our Titanium Meteorite Ring Page. We offer fine quality Custom made, Titanium-lined Gibeon meteorite rings with quick turn-around times. Each ring has been paintakingly crafted from the finest material and then etched to reveal the natural Widmanstatten pattern characteristic of the Gibeon meteorite. Each ring is a unique work of natural art born of the Cosmos and comes with a Certificate of Authenticity. Due to the Custom Nature of each order, there is a NO RETURN POLICY ON ALL CUSTOM MADE RINGS. Titantium lined rings are more affordable that than those lined with most precious metals. Titanium is an inert metal and is hypo-allergenic. Titanium rings are about a third the weight of similar rings made from platinum or gold, so while most people prefer the heft of a dense precious metal for their wedding bands, titanium may be an option for those that don't mind a light ring. Our titanium rings are crafted from 6AL4V aerospace grade titanium billets for strength. If you are looking for a custom meteorite ring or a custom meteorite ring, or wedding band lined with gold, platinum, or palladium check out our fine selection of Custom Meteorite Rings. Our rings are made exclusively from hand selected pieces of Gibeon Meteorite. The Gibeon meteorite entered our atmosphere at an incredible velocity of around 17 miles per second an estimated 30,000 years ago. Pieces impacted over a large region of what is present day Namibia, Africa. Prior to this, the Gibeon meteorite traveled through space for over four billion years before it was trapped by the Earth's gravitational field and pulled to earth as a brilliant fire ball. The Gibeon meteorite is composed primarily of various alloys of iron and nickel, as well as a number of extremely rare elements, not found on Earth. It was derived from the core of an extinct planet that was blown apart billions of years ago during the formation of our solar system by a catastrophic impact event. 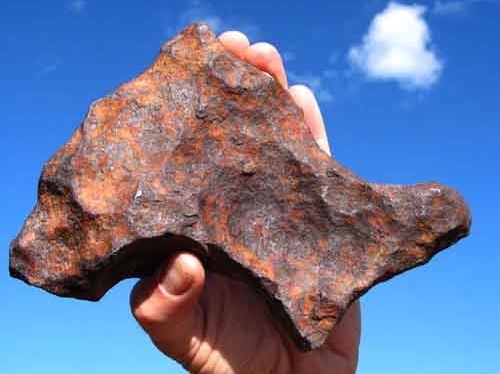 Though the Gibeon meteorite was "officially" discovered by westerners in 1838, the indigenous people of the region had been making spear points and tools from the meteorite for perhaps thousands of years. 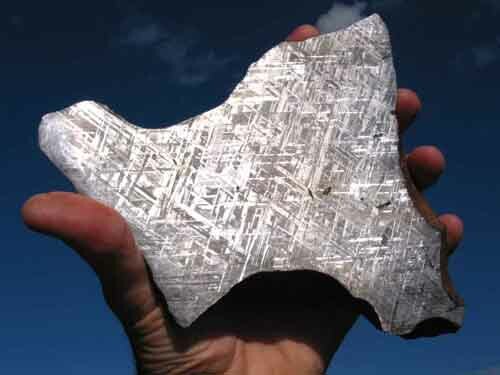 The beautiful crystalline patterns within Gibeon meteorites are known as Widmanstatten patterns, and are unique to meteorites. These patterns can only form over millions of years of cooling. It has been estimated that it took about 1000 years for these molten pieces of planetary core to cool by just 1 degree Celsius! There isn't any material on Earth that exhibits the Widmanstatten pattern of meteorites, and each piece of meteorite has its own unique pattern. The beautiful crystalline patterns characteristic of the Gibeon meteorite are more than just beautiful oddities-they tell us about its composition and how long it took for the planetary core from which the meteorite is derived to cool!